NTI Media Maker is CD mastering software. Using Media Maker and a supported CD/DVD recorder, can produce Compact Discs in various formats, including CD-ROM,DVD-ROM, Audio CD/DVD,Video CD,Mixed Mode and CD Extra. It enables computer users to quickly and easily begin producing audio, data, mixed-mode CDs and DVDs.It's Multi-Burning engine allows users to simultaneously write multiple CDs or DVDs. It supports the newest internal and external drives. It is a CD mastering software producing audio, data, mixed-mode CDs, and DVDs. 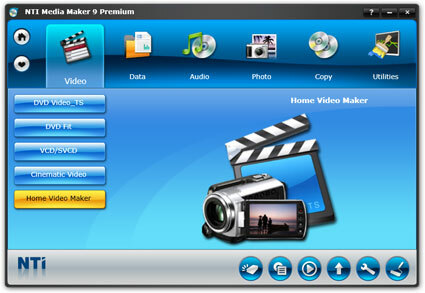 NTI Media Maker 9 enables computer users to quickly and easily begin producing audio, data, mixed-mode CDs, and DVDs. Media Maker's Multi-Burning engine allows users to simultaneously write multiple CDs or DVDs. It also fully supports the newest internal and external drives, including 16x DVD-R drives. NTI Media Maker's intuitive user interface allows you to instantly navigate your way around your computer to locate files easily. Locate files using the Windows's find utility easily from the toolbar. NTI Media Maker's user interface has never been easier. All operations are accomplished in very simple steps. Each step is clearly identified by Media Maker. * Records Audio CD/DVD's on the fly directly from line-in and microphone, ideal for live sound recording such as Karaoke. * Premasters Video CD/Super VCD, Mixed Mode, CD Extra, and Custom CD. IEBMaker build an Internet Explorer bar tailored to your company's needs. A high-powered program to search media files or your desired ones swiftly. a software to create labels for CD or DVD and design and print case inserts. Create media image presentation with music. Qweas is providing links to NTI Media Maker 9 as a courtesy, and makes no representations regarding NTI Media Maker or any other applications or any information related thereto. Any questions, complaints or claims regarding this application NTI Media Maker 9 must be directed to the appropriate software vendor. You may click the publisher link of NTI Media Maker on the top of this page to get more details about the vendor. JNIWrapper for Windows (32/64-bit) Std.